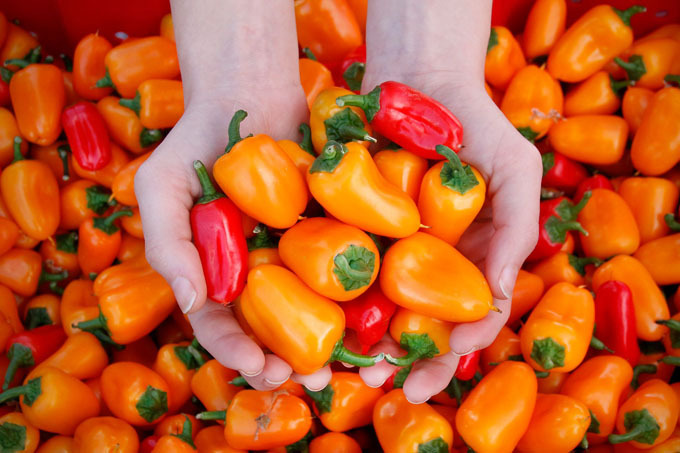 The BC growing season is in full swing, and there’s no better way to experience summer than with a trip to one of BC’s 145+ farmers’ markets. Whether you’re headed on vacation with family or friends, or taking the summer to explore your local community, here’s everything you need to build a farmers’ market visit into your summer travels across the province. Here are four tips for your next BC Farmers’ Market Visit. With over 145 BC farmers’ markets across the province, you’re sure to discover more than a few that you’ll love to return to year after year. go back to again and again. This helpful BC Farmers’ Market Finder tool will help you make the tough choices (peaches in Kelowna, or honey in Metchosin?) — and you might be surprised to see how easy it is to access more than one farmers’ market closer to home. Here’s a tip: BC farmers’ markets are a smart place to stock up on the freshest summer ingredients. Not only is the food fresh and local, you can get great advice from the farmers who grew it! Ask for tips on produce varieties, preparation, storage, preserving, and recipes and if you’re an aspiring farmer or just interested in their work you could ask them where they get their equipment from, like these Power Harrows. High summer is prime time for taste, no matter which region you visit in BC. Nectarines, plums and peaches are all must-buys at farmers’ markets in the Thompson-Okanagan, and cherry fans can sample their fill in the Kootenay/Rockies. If you’re looking for blueberries, pick the Fraser Valley – that’s where farmers from Richmond to Agassiz supply 97% of highbush blueberry production for Canada. On Vancouver Island and the Gulf Islands, look for wildcrafted delicacies like seaweed and blackberries, along with delicious cheeses from the Cowichan Valley. And if you need a reminder that farmers’ markets are a perfect place to find locally produced baked goods and handmade treasures, check out the farmers’ markets further north – Prince George’s award-winning year-round farmers’ market features outstanding baked goods and locally roasted coffee, while markets throughout the Cariboo/Chilcotin area offer locally sourced pasture-raised meat…including interesting products like llama! BC farmers’ markets are tasty and fun, but they also play a vital role in your local economy. Did you know that for the first time in 20 years, the number of farmers aged 35 and younger in BC is on the rise? But expensive land, and high start-up costs can be challenging for new farmers starting out – choosing to shop at BC farmers’ markets is one way to help these new farmers grow (and keep all farmers productive!). The BC Association of Farmers’ Markets runs the Farmers’ Market Nutrition Coupon Program, which helps increase access to fresh, local food for lower income families and seniors in BC. And by shortening the distance from farm to table, farmers’ markets are a powerful way to reduce your carbon footprint – and build the kind of community you want to bloom. Tip 4: Take your time! BC farmers’ markets are the ideal place to connect with “Slow Food”: investing in local crops and taking the time to prepare food carefully. But while the approach is “slow”, the market isn’t. It’s no surprise that farmers’ markets are a hive of activity: on any given visit you might find live music, chef demos, family activities, new trends like wild harvested food and products, and artisanal food producers. With more evening farmers’ markets popping up across the province like Oaklands Sunset Market, you can enjoy exploring new foods under the stars. Ready to tour BC farmers’ markets? 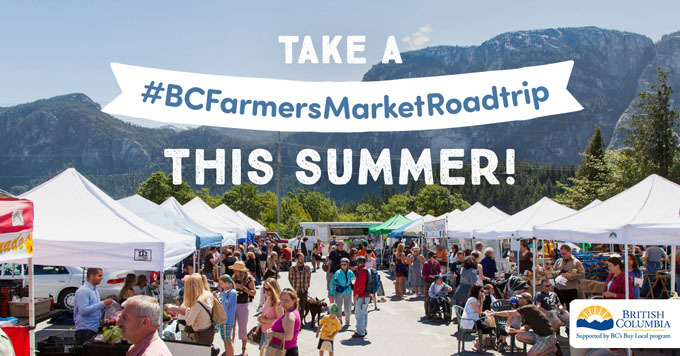 Take your camera along for the ride and enter the BC Farmers’ Market Roadtrip Contest: just share a photo of your farmers’ market adventures with the hashtag #BCFarmersMarketRoadtrip for a chance to win one of five weekly prize draws for a $50 BC farmers’ market shopping trip! This contest runs from July 17 to August 18, 2017. Follow BC Farmers’ Markets on Facebook and Instagram for details.